Roy Jones Jr. Boxing Promotions has put together a solid card to support the World Boxing Organization (WBO) junior bantamweight world title eliminator between “Mighty” Aston Palicte (24-2-1, 20 KOs) and Jose “Chiquiro” Martinez (20-0-2, 13 KOs) on February 1 (AEDT) at Viejas Casino & Resort in Alpine, California. The show promoted in association with Miguel Cotto Promotions is the inaugural event of a new agreement between Palicte’s promoter, RJJ Boxing, and UFC Fight Pass, which is set to produce up to 72 professional boxing events over the next three years. 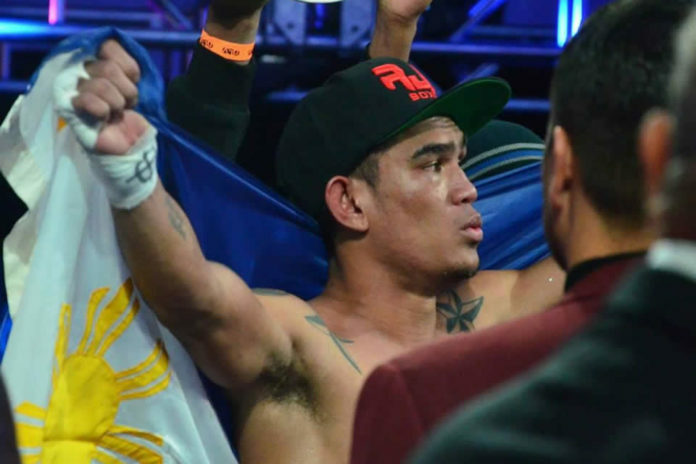 The winner of the Palicte vs. Martinez 12-round main event will become the mandatory challenger for new WBO junior bantamweight and four-division world champion, Donnie Nietes (42-1-5, 24 KO). WBO No. 2 rated Palicte is promoted by Roy Jones Jr. Boxing, WBO No. 4 ranked Martinez by Miguel Cotto Promotions. Last September, Palicte (WBO No. 2) fought a 12-round split draw with his fellow Filipino, Nietes, for the then vacant WBO Junior bantamweight championship. The co-featured event is a rare six-round match-up of two undefeated prospects, Texas featherweight Edward “Kid” Vasquez (5-0) and San Diego’s Brandon “2 Smooth” Cruz (6-0, 4 KOs). Styles make fights and consummate boxer Vasquez vs. slugger Cruz has all the ingredients for a highly entertaining, competitive fight. The Fight Pass opener pits local favorite Dilan “El Rey” Miranda (4-1, 3 KOs) versus Daniel Constantino (2-2-1, 1 KO), who is straight out of Compton (CA), in a scheduled six-round, junior featherweight bout. Fighting on the off-streamed card in four-round fights are San Diego featherweight Jessica Juarez (1-0, 1 KO) vs. Kailyn Hansen (1-2), of Whittier, CA; Redlands, CA welterweight vs. David Morales (2-1-1), of Los Angeles; Los Angeles heavyweight Oscar Torres (3-0, 1 KO) vs. Ignacio Zambrano (2-4), of Torrance, CA.